When given the choice, we often opt for oodles of noodles over servings of salad. But individuals with celiac disease don’t have a choice in passing on pasta. Those with the autoimmune disorder risk damaging their intestines if they eat gluten. Fortunately, the damage is reversible by eating a gluten-free diet, which makes noodle substitutes a home run. Zoodles are a healthy and delicious alternative to pasta. 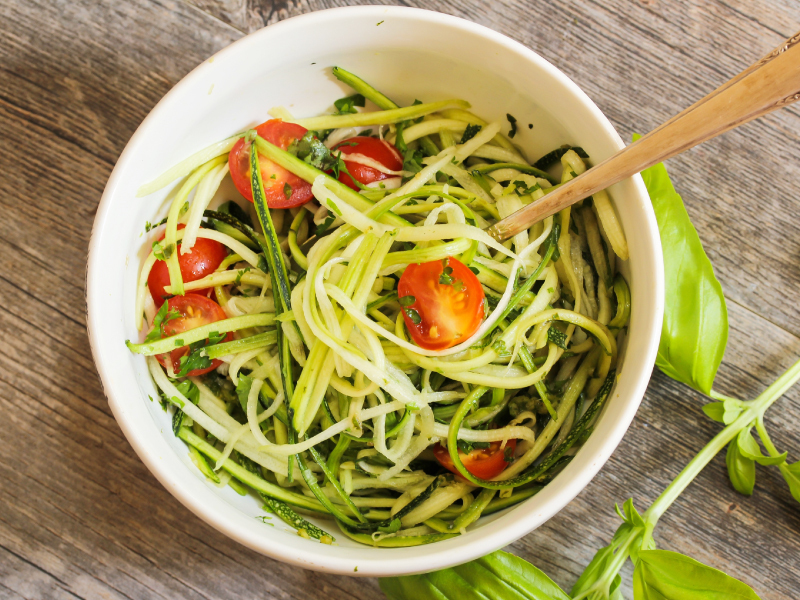 Whether you have celiac disease, gluten intolerance or you’re just trying to cut carbs, these zoodles will please every palate. Filled with fiber, this crunchy green contains 95% water, making it a great choice for your body and smile. Zucchini also contains calcium and vitamin C, which help to strengthen tooth enamel and promote healthy gums. Preheat the oven to 425 degrees. Toss the Parmesan in a shallow dish with the Italian herbs, salt, and pepper. Heat the oil in a medium ovenproof skillet over medium heat. Cut the chicken breasts into a total of four pieces and dip in the cheese mixture. Add the chicken to the hot skillet and cook for 3-4 minutes on each side. The inside can finish cooking in the oven. Transfer the skillet to the oven and bake for 5-10 minutes or until the chicken is fully cooked. Add the sauce and place a slice of mozzarella cheese on top of each piece of chicken. Return to the oven for a few more minutes or until the cheese is bubbling and lightly browned. While the chicken finishes, cut the zucchini into thin shreds or use a spiralizer to create the zoodles. Serve the chicken and sauce over the raw zucchini noodles and sprinkle with Parmesan and parsley. ← Could Sugar, Soda Taxes Improve Public Dental Health?